Last month, in support of International Children’s Day we continued our efforts to promote child helmet use and protect children from head injuries when they are riding as a passenger on a motorcycle. We donated 364 helmets to primary school students in Cambodia, led provincial government meetings to increase local child helmet rates in Vietnam, and attended this year’s GRSP Asia Seminar in Manila with the focus on improving road safety for children. Read on for other activities our teams have done to help prevent road injuries and deaths among children. Motorbike-taxi drivers give first aid to traffic victims- A group of motorbike-taxi drivers in Binh Duong Province have formed a team to give free first aid to victims of road crashes. Set up under and an initiative of the Red Cross, the teams are provided with first aid training and kits. The group’s willingness to arrive quickly at crash sites and give aid has helped over 2,000 people. Source: Vietnam Breaking News, 30 June 2014. In May, Johnson & Johnson celebrated SAFE Fleet’s 20th Anniversary. SAFE Fleet is J&J’s approach to protecting its employees, families and communities. It provides education and training to employees about safe driving techniques, and has led to reductions over time in road crash rates and injury rates. To celebrate the twenty year milestone, a meeting was held to improve fleet safety and business-related competencies, share best practices and corporate social responsibilities, and cultivate external relationships and partnerships. AIP Foundation representatives, Nuong Nguyen, Director of Programs, and Naomi Fujiki, Development Coordinator, attended the meeting and presented on Johnson & Johnson's sponsorship of the Helmets for Kids program in Vietnam under the UN Decade of Action for Road Safety. Through this program which started in 2012, Johnson & Johnson will have donated over 30,000 helmets by the end of 2014. In October 2013, AIP Foundation, funded by the Global Road Safety Partnership, with financial assistance from the Bloomberg Philanthropies, trained policymakers and the media to report effectively on road safety issues. The training workshops were developed to strengthen the implementation of child helmet regulation and awareness raising in Vietnam. In the six-month post-training assessment, 95 percent of government officers and 87 percent of journalists reported that they had applied what they learned in the training to their work, and the majority reported that they had shared the knowledge with others. Following the training, journalist trainees produced 80 news articles, features, and TV documentaries. Government trainees applied the training through a variety of activities, such as training others, developing communication plans, and assessing the current helmet use situation. Road safety stakeholders of Binh Duong province meet to discuss the provinces road safety needs. 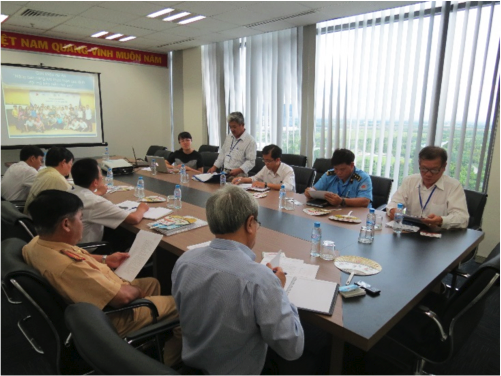 In June, AIP Foundation, met with road safety stakeholders from the Mekong Delta and Binh Duong Province. Government officers including representatives from the Traffic Safety Committee, Departments of Education & Training, Traffic Police, and the local media in provinces of An Giang, Can Tho, Tra Vinh, Binh Duong, Tay Ninh, and Long An attended. The meetings, funded by the Global Road Safety Partnership, with financial assistance from the Bloomberg Philanthropies, were held to gather necessary information about each provinces’ child helmet use situation and develop capacity building courses. Provincial governors showed their interest in the project requesting for follow-up activities and road safety programs for local primary schools which AIP Foundation agreed to support. In return, each province committed to make their own annual action plan to increase local child helmet rates. Govenors also committed to providing AIP Foundation all the necessary reports and local statistics as required to implement the project. By July, AIP Foundation expects to sign a Memorandum of Understanding with the participating provinces to formalize the commitments and roadmaps aimed to increase child helmet wearing rates in these localities. Avi Silverman, FIA Foundation’s Director of Campaigns and Communications and the AIP Foundation team vote for ‘better transport and roads’ to be included in the UN’s Post-2015 Sustainable Development Goals. 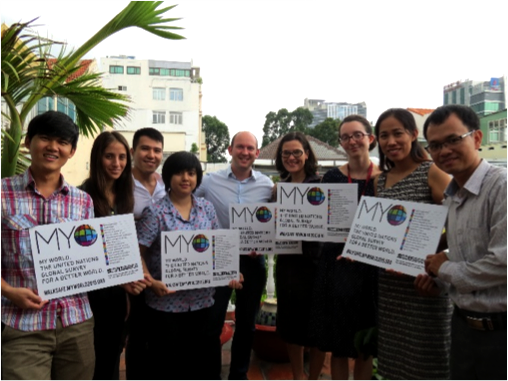 On June 26-27, Avi Silverman, FIA Foundation’s Director of Campaigns and Communications visited AIP Foundation offices in Ho Chi Minh City and Hanoi. The FIA Foundation, an independent charity that promotes road safety has supported AIP Foundation’s programs since 2008. Presenting the “MY World” campaign to the AIP Foundation team, Avi emphasized the necessity of support needed from countries and organizations to advocate for road safety and reach the campaigns target to reduce road traffic fatalities by 50% by 2030. He also stressed the importance to vote for ‘better roads and transport’ and ‘better healthcare’ as part of the post 2015 Sustainable Development Goal priorities. Make your voice heard by going to the MY World website and vote for your top priorities. In the priorities, we ask you to vote for ‘better transport and roads,’ ‘better healthcare,’ and also suggest ‘road safety’ in the optional priority tab. Students of Kor Ki Primary School receive helmets and road safety education during International Children's Day. The UPS Foundation supported International Children's Day in Cambodia by donating 364 helmets to first grade students at Kor Ki Primary School of Kandal Province. The Helmets for Kids program aims to promote child helmet use and protect children from head injuries when they are riding as a passenger on a motorcycle or on a bicycle. 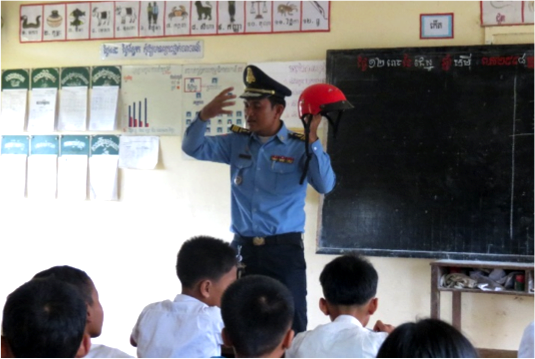 Since 2012, AIP Foundation has worked together with The UPS Foundation at three schools in Kandal and Kampong Speu Provinces to donate helmets and provide road safety education to students and teachers. 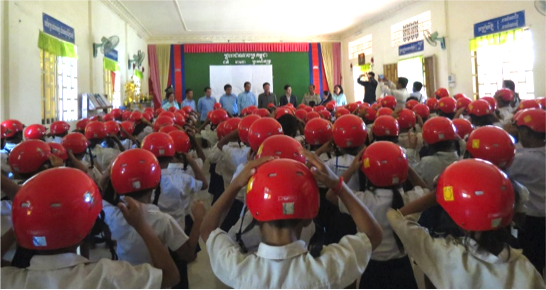 Last school year, 2,760 students in Cambodia received helmets under the Helmets for Kids program sponsored by The UPS Foundation. The results of the initial helmet donations have surpassed expectations with average helmet use rates across the schools, originally near zero, increasing to an average of 86 percent at the end of the school year. A Senior Traffic Police Officer from Kandal Province explains the importance of helmet use. AIP Foundation's Helmets for Kids program, sponsored by The UPS Foundation ran interactive road safety activities for school children in Kampong Speu and Kandal Provinces. Traffic Police led the activities and lessons to increase students’ road safety awareness before their school vacation. Through the activities, students were reminded about their vulnerability on the roads. The Traffic Police also equipped them with life-saving road safety knowledge and skills. In parallel with the activities, The UPS Foundation donated nearly 1,000 additional helmets to new students at Hun Sun Prek Russey, Vorsar, and Kor Ki Primary Schools. The helmets are a daily reminder for students to observe the information they gained from the Traffic Police. A mother expresses her thoughts related to the reasons children do not wear helmets. Road safety education in schools is very important, particularly sustaining the messages and helmet use rates within the school’s community. 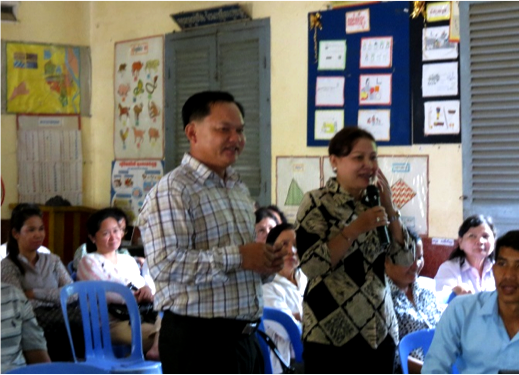 To address this, AIP Foundation held a “My mom and helmet use.” forum sponsored by Manulife (Cambodia) Plc, at Wat Preah Put Primary School to help mothers further inform and educate their children. During the forum, fifty mothers were educated around the topic of road crashes related to helmet use, parents’ roles in helmet use, and the impacts of road crashes. Additionally, mothers were given the opportunity to express their ideas and concerns related to their own road safety and of their children’s. Real life examples were raised and discussed to expose the seriousness of road crashes and the importance of helmet use. Parents also pledged to encourage their children to wear helmets no matter the distance or time.